Miles of boreal shoreline and sheltered coves to explore by day, and magical nights beneath a blanket of stars so bright you could scoop them up in your hand. And if you’re lucky, be dazzled by the aurora borealis, our namesake. Whether your pleasure is exploring, lounging, world-class fishing, sightseeing, a family celebration, working holiday, or all the above, come aboard an Aurora Houseboat for fun and adventure! 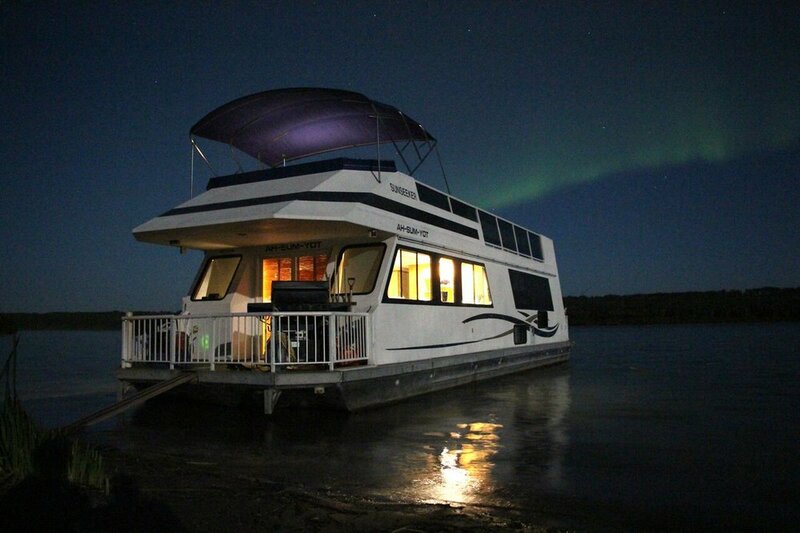 Aurora Houseboats has been serving tourists for more than twenty years and maintains a fleet of fine crafts sized to match your particular needs. You be the skipper, or let us be your guide. Just tell us how we can make your floating holiday special and we will tailor your package so it is just right for you. Then, relax—and leave your cares on the dock! We have three models to choose from, suited to the size of your party and the onboard amenities you desire. Our boats operate from mid-May to mid-September. We recommend booking as early as possible to avoid disappointment. Tobin Lake, created in 1963, is the basin for E. B. Campbell Hydroelectric Station. Special landmarks along the lake such as “Eagle’s Nest” as well as remote resorts and a special village offer memorable vistas and ports of call. River Cruises & Tours, catered if desired, are available on request. Come, relax on beautiful Tobin, and enjoy your favourite foods prepared to your taste. Rates available upon request.